( Click TWICE! to Enlarge) When I was nine or ten - in 1947 or '48 - I spent a week at church camp on Lost Lake in the Okanogan, and fell deeply in love with the older daughter of another preacher who like my pop was also lecturing that summer at the same camp. But that is a distraction from this story. On the way from Spokane we drove across the top of the Grand Coulee Dam spillway and dad stopped the car - it was permitted - so that we could get out and look over the edge. It changed my life - it did! Looking directly down on the spillway ignited some dreadful genetics of fear in me, and I have been frightened of heights ever since. When I came upon this slide by Sykes my heart - holding hands with my stomach - leapt again. 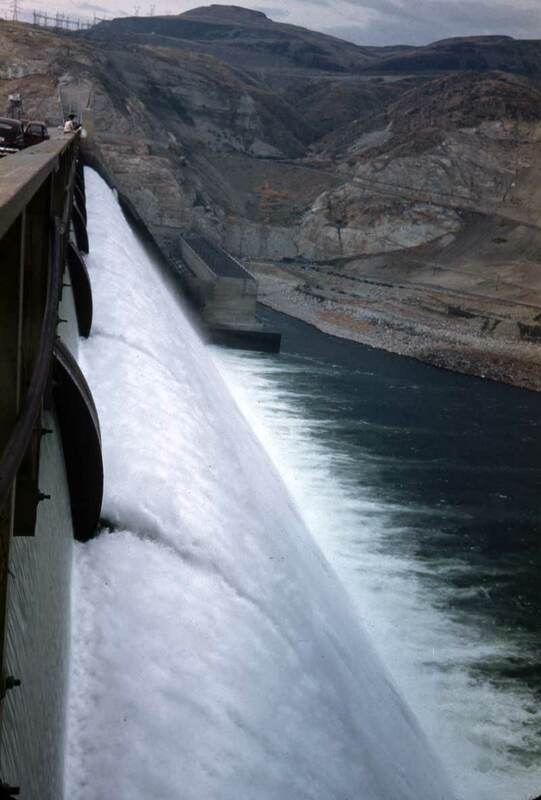 Horace started visiting the dam when it was under construction in the late 1930s. The generators put out power first in March 1941, ahead of schedule. When it was still one of the "eight wonder of the modern world" recitations of the dam's statistics were popular. Taller than the Smith Tower, as long as 14 ordinary city blocks (4,200 feet) it held four times as much mass (concrete) as the Great Pyramid of Cheops, and three and one-half times that of Boulder dam, the dam Californians bragged about. The concrete below this spillway might have - and could have - built a monument 100 feet by 100 feet nearly six miles high. The concrete here might have built a two-lane highway from New York to Seattle and returned by way of Los Angeles (what a coincidence!). Or my favorite, if this concrete were all shipped in one freight train, it would be 500 miles long an contain 50,000 box cars. (This would have been a real hardship on the estimate two million hobos that were riding the rails during the Great Depression, when the Grand Coulee was being built. Some of them, no doubt, worked on the dam.) 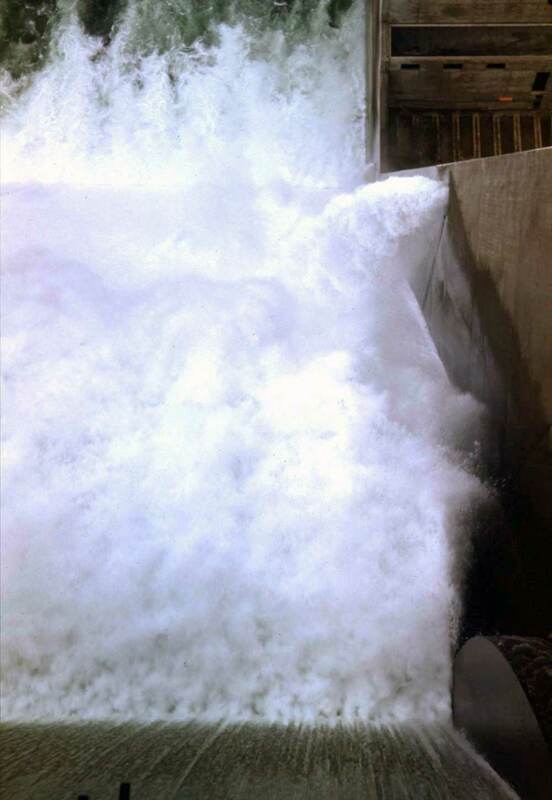 The 1,654 feet spillway at the center could discharge 450 million gallons a minute. And with that statistic my heart leaps again.